Flash Fire Powers up Fire-type moves if hit by a fire move. "When this Pokemon takes damage from a Fire move, it becomes immune to Fire moves and all its Fire moves do 50% more damage until it leaves battle." Justified* Raises Attack one stage upon being hit by a Dark move. for its beauty. It runs agilely as if on wings. charmed by its grace and beauty while running. icent. Many people are enchanted by its grand mane. Silver Its magnificent bark conveys a sense of majesty. Anyone hearing it can't help but grovel before it. attracted to its movement as it ran through prairies. 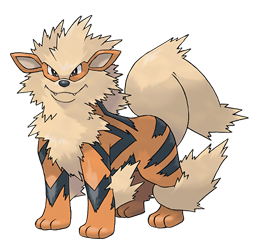 Ruby/Sapphire ARCANINE is known for its high speed. It is said to be capable of running over 6,200 miles in a single day and night. The fire that blazes wildly within this POK�MON�s body is its source of power. Emerald This fleet-footed POK�MON is said to run over 6,200 miles in a single day and night. The fire that blazes wildly within its body is its source of power. FireRed A POK�MON that is described in Chinese legends. It is said to race at an unbelievable speed. Leaf Green A POK�MON that has long been admired for its beauty. It runs agilely as if on wings. Diamond/Pearl Its proud and regal appearance has captured the hearts of people since long ago. Platinum Its proud and regal appearance has captured the hearts of people since long ago. Heart Gold This legendary Chinese Pok�mon is considered magnificent. Many people are enchanted by its grand mane. Soul Silver Its magnificent bark conveys a sense of majesty. Anyone hearing it can�t help but grovel before it. Black Its proud and regal appearance has captured the hearts of people since long ago. White Its proud and regal appearance has captured the hearts of people since long ago.